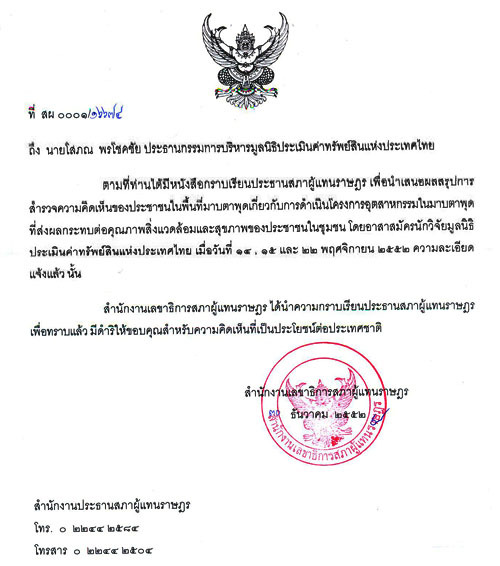 I informed Mr. Abhisit that the majority of people in Map Ta Phut wanted the manufacturing activities to continue to expand.� I also proposed him to amend the Constitution because it seemed unrealistic and non-democratic. This survey was conducted on November 14, 15, and 22, 2009 with 1,107 households covering 3,918 people from a 33,492 population total.� It was found that 65.3%, or two-thirds of the people, interviewed wanted to see the manufacturing activities to expand for the sake of their income and continuing economic development. The number of those who were suspected to be sick due to pollution was some 12.86% during the period of one year.� However, almost all of these individuals had a simple illness, such as an allergy.� Yet, this percentage was smaller than the overall illness of the population nationwide.� According to previous studies, those who died due to cancer were less in Map Ta Phut than the overall average of Thailand. In the case of need, public land acquisition by means of voluntary land sales or expropriation can be applied to this case.� This will help expand the industrial areas as well as build a buffer zone between the industrial settings and residential areas.� One key success is fair compensation at or above open market value.� If people are relocated some 10-20 kilometres away to be safe from pollution, they can still commute conveniently upcountry. 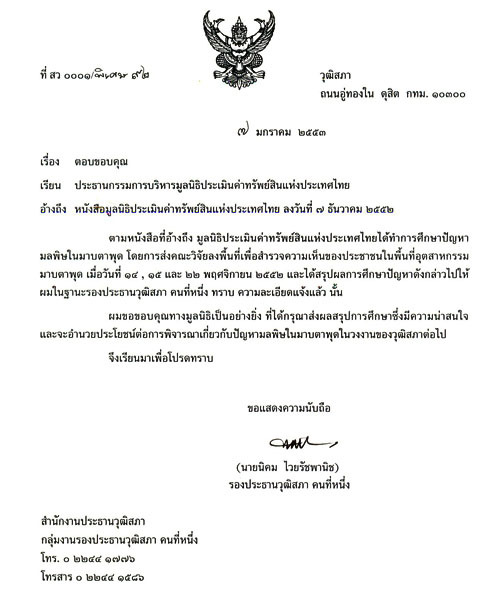 One big question concerns the "representatives of the people" in an ad hoc committee appointed by Mr. Abhisit to solve this problem.� All of them were doubtful about their status.� Only one of them was born in Rayong and he is an NGOs staff and board member of the New Politics, a new political party.� They were rather the representatives of academic people who were already appointed.� None of the people or community leaders of Map Ta Phut were appointed. 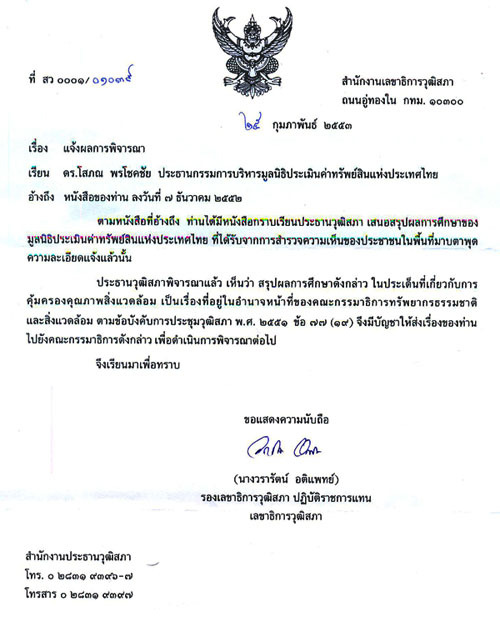 This leads to my proposal to Mr.Abhisit to amend the Constitution, particularly Article 67, which stipulates that an independent committee will be appointed from the representatives of NGOs and universities related to environment issues.� This is not democratic.� The government could appoint anyone it favors, with no standard of selection.� Those from NGOs and universities can also be biased and not independent.� How can they have a privilege to make a decision for the general public, particularly the community?� This does not help the community but on creates a dictatorial atmosphere.� Solutions must come from scientific studies with transparency.� In addition, the right of the community is important, but right of the nation is supreme.� That is why there is an option for expropriation stipulated in this Constitution as well. We propose to the government that it deal with the crime of pollution steadily and seriously.� This will help solve most of the problems, and the community can join with quite a few independent organizations to follow up on this pollution closely.� In order to know the needs of the people, a referendum or a thorough opinion survey of the people must be conducted.� Eventually, buying land from the people or expropriating it should be considered in order to pave way for the expansion of manufacturing activities in Map Ta Phut, the only designed industrial region of Thailand.